Cirque Du Solei is the the largest theatrical company in the world, so it makes sense why Rival Gaming chose to base a pokie on them. Rival Gaming are renowned for their innovative iSlot series with intricate storylines and visuals; the graphics are colourful, clear, and exciting, while gameplay offers a multitude of bonus features. So if you’re doing backflips for this pokie, keep reading to find out exactly how to play Cirque Du Slots by Rival Gaming. Cirque Du Slots features 25 paylines across 5 reels and is based on the theatrical company, Cirque Du Solei, a group who perform worldwide as a unique take on the circus and as such Rival’s pokie can be summed up best as a modern circus on a slot. While the symbols aren’t exactly three dimensional, there is a sense of depth to them which immerses the player into the theatrics. The bright colourful theme embodies everything you’d expect to see at the circus while the soundtrack adds the mystery we see with Cirque Du Solei – you can mute this via the options, as well as change the game speed, and more. Coin sizes range from 0.01 up to 0.25 with a minimum bet set at $0.10 and maximum bet set at $62.50. Symbols include the traditional 9, 10, J, Q, K, and A symbols representing the lower payouts, with the highest possible payout being five A’s at 80 coins. The middle value symbols include the maracas, the mask, the wizard hat, and the circus ball, with the highest possible payout being five wizard hats at 300 coins. The highest paying symbols include the top hat and the purple painted woman offer 400 coins and 500 coins, respectively, by landing five of the symbols on an active payline. One of the best features to the pokie is the Wild symbol, which is the green painted lady, as it is an Expanding Wild and does so whenever there is the chance to complete a winning payline. Additionally, Wild wins have a 3x multiplier applied. It is also important to keep an eye out for the Free Spins symbol, also known as the Scatter, which is the unusual looking clown, as at least three trigger the Free Spins feature. The Wild symbol also Expands, but in certain ways depending on the Act you are in, as we detail below. Additionally, to trigger the other Bonus feature be sure to aim for at least three Unicycle symbols, and you will be greeted to an advanced level of gameplay (see below). To view all of the payouts available, simply click on the ‘Paytable’ link in the top right or top left hand of the pokies screen. 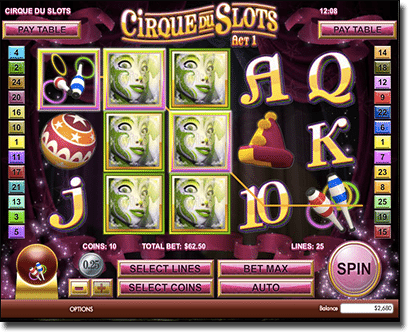 There are plenty of bonus rounds to Cirque Du Slots, including one which is quite unique. Expanding Wilds: As we detailed above, Cirque Du Slots offers Expanding Wilds where the Wild symbol will expand over up to an entire reel to complete a winning payline. However, it will not substitute for Scatter symbols – though it does feature in the Free Spins bonus. Bonus Act: Spin at least three unicycles and you will see gameplay advance to the next level. This feature works in conjunction with the Free Spins feature as the Expanding Wilds get better as you increase the Acts. Cirque Du Slots represents the modern take on a circus so well you’ll be transformed into a world of acrobatics, jugglers, clowns, and other amazing stunt performers just by clicking the ‘Spin’ button. The graphics are executed quite well, and while 3D technology would’ve made this pokie even better we were quite satisfied with the high quality images. What’s more, when the Wild expands a performer flips into the air along the reels or the rows, which brings the reels to life. The seven free spins seem a bit disappointing and while you can’t re-trigger them during the Free Spins feature we managed to activate it a few times over the course of playing. Getting the gameplay levels to move up was a bit harder to do, but when we did and we triggered the free spins feature to, it was well worth the wait. 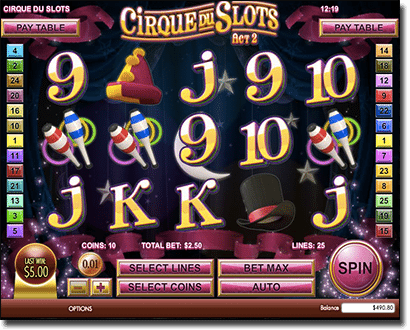 Overall, Cirque Du Slots is an entertaining pokie and the unique bonus features are a welcome addition. You will find Rival’s pokie at our number one recommended online casino www.SlotsMillion.com. If you are a new member you can opt in for the welcome bonus of up to $100 matched on your first deposit. 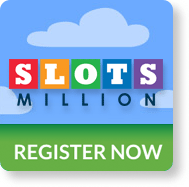 Just click our links to register an account and then locate Cirque Du Slots using Slots Million convenient search bar.